The Schuylkill River often gets a bad rap around Philadelphia. It's not exactly the cleanest river, and it floods—frequently. Despite it’s reputation as the redheaded stepchild of Pennsylvania’s rivers, the Schuylkill cuts right through the heart of our fine city and provides a channel for untapped potential in water sports. Its larger sister, the Delaware River, may get all the glory, but the Schuylkill deserves a chance in its own right. 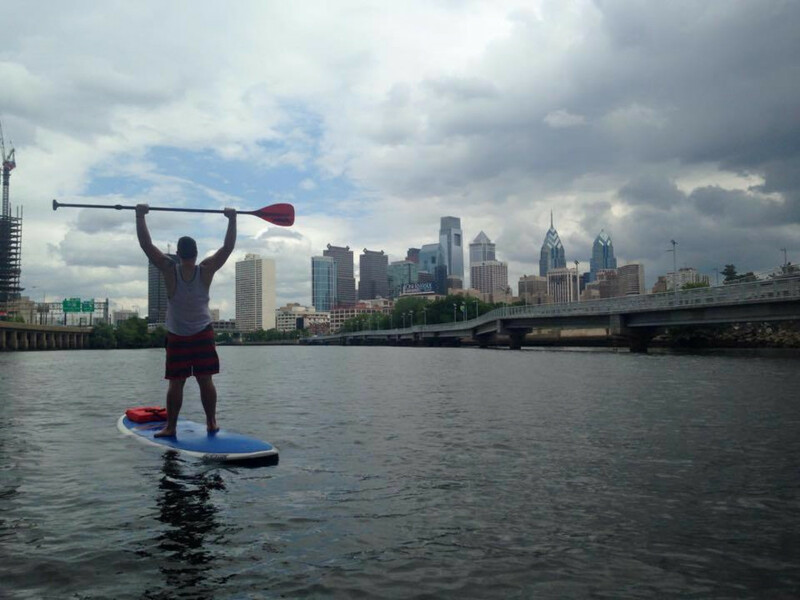 So last Sunday, I decided to head to Standup Philly, a brand new stand-up paddleboard rental and tour company, to give the Schuylkill a shot at winning me over. Standup Philly opened in early summer 2015, and is located at Bartram’s Garden’s Community Boathouse right on the Schuylkill in West Philadelphia. I arrived just in time for my 3 p.m. rental, and parked at the visitor parking circle. This part was tricky—make sure to look for the little Standup Philly signs after you park, which will direct you down a paved path for about a quarter mile until you hit the river. Take a right, and you’ll see two shipping containers that are the Community Boathouse. After signing a waiver and paying for my two-hour SUP rental, I headed down to the dock with Justin O’Brien, one of the Standup Philly employees. He’s an environmental scientist who is still pretty new to SUPing, but his chill vibe and positive attitude made me feel at ease as he reviewed the basics with me. I had SUPed once before, but on the flat Cape May harbor with a guide, so this solo adventure was new, exciting, and a little scary all at the same time. The Patriot—a fun tour boat that transports visitors along the Schuylkill—was about to dock, and I pushed off just in time to miss its wake. I began paddling upstream towards Center City, surprised by how easy it felt to paddle against the current. I would later learn that at this point in the river, the Schuylkill’s flow changes with the tides and I was, in fact, paddling with the current. Regardless, I took in the strange beauty of my surroundings, which included a few dilapidated docks, some old bridges, and the newly built Grays Ferry Crescent portion of the Schuylkill River Trail. It was fun to experience a part of the river I’d only seen outside the window of my car on I-76. I soon worked up a sweat as I paddled slowly and steadily up the river. As I turned the bend at Grays Ferry, the full skyline came into view and I felt a chill run down my spine. I had never seen the Philly skyline while standing on the Schuylkill before, and it offered a brand new view of the city I’ve come to call home. I smiled and paddled on, dodging wakes from jet skiers and small boats, waving to those passing me by. As I approached the South Street Bridge I thought about the hundreds of times I’d driven and run over that bridge, and enjoyed the first time experience of paddling under it. I continued on parallel to the Schuylkill River Trail, watching the runners, walkers, cyclists, and skateboarders move next to me on land. I also reflected on the countless times I’d run on that trail, gazing out at that empty river next to me, and I was finally on it. When I passed under the Walnut Street Bridge, I waved to The Patriot, which had passed me on the way back upstream. The crew yelled over asking if I wanted a water and I gladly took them up on their offer. I thanked them, and they wished me good luck heading back to Bartram’s Garden against the tide. I turned around and paddled back down the river, and didn’t really notice much of a difference in the current from the other direction. The breeze tickled my sweaty skin as I headed back, and I felt truly at ease on the board in the second hour of my excursion. When I returned to the dock, Emily Carter from Standup Philly was there to help me ashore. She’s a school counselor in Philadelphia and has a love for helping others. I walked back up to retrieve my belongings from the boathouse with Emily, and there I met Melissa Clemens, owner and founder of Standup Philly. Melissa is also a school counselor with a vibrant passion for helping people. 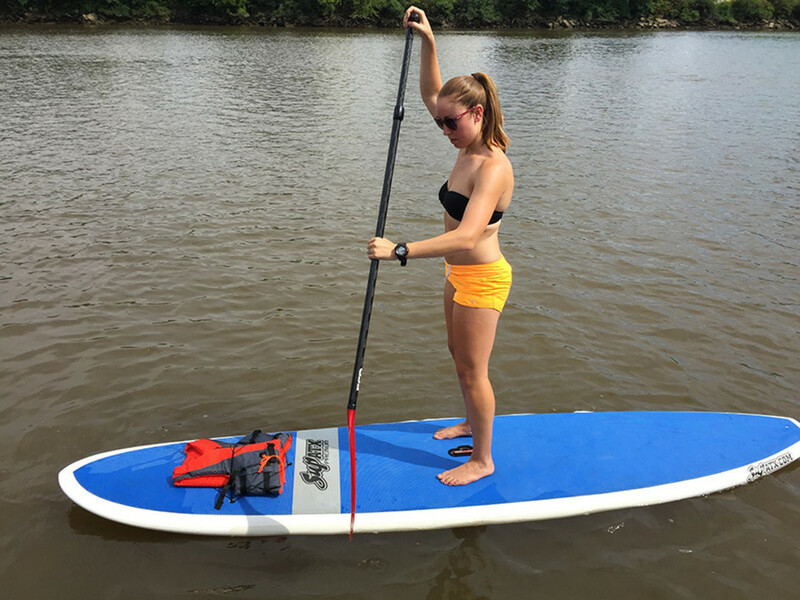 Though she only started paddling in 2013 on a trip to Acadia National Park, she immediately purchased her own board and has taught many friends to SUP in the last two years. 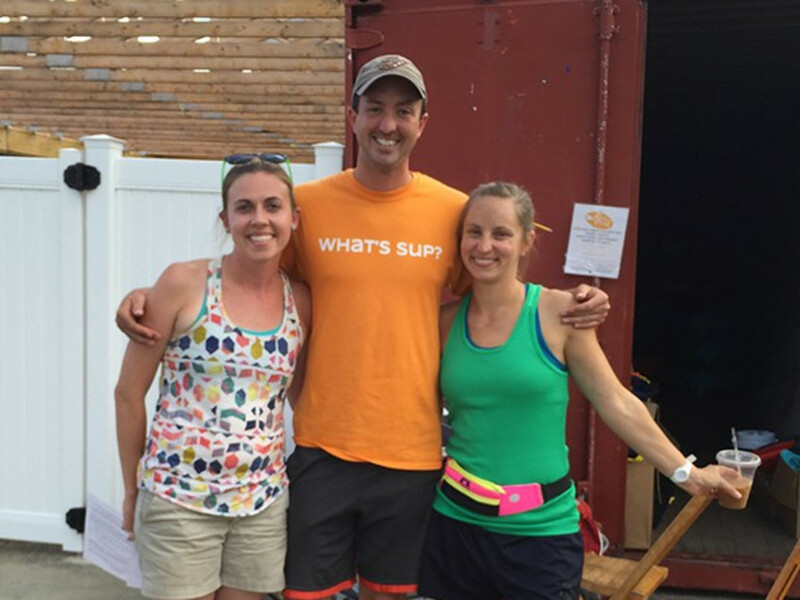 Before leaving, I talked for a few minutes with Melissa, Justin, and Emily about Standup Philly’s mission—they aim to educate paddlers about the Schuylkill and the environment, and also help Philadelphians relieve stress in a fun and meaningful way. They are doing this mainly through two hour guided tours, a perfect option for first-time SUPers who aren’t ready to go out alone. The tours are also a great option for folks wanting to learn more about the Schuylkill and Philadelphia. If you’d rather go solo, rentals are $25 per hour or $60 for the day. Standup Philly will be open on weekends with limited hours throughout September. After spending two hours on the Schuylkill, I’ve certainly changed my opinion of our city’s second largest river. I didn’t come across any dead bodies, and the worst things I encountered were a few pieces of floating trash. I’ll definitely be returning to SUP on the Schuylkill, perhaps with my own board if I can scrape together the money. 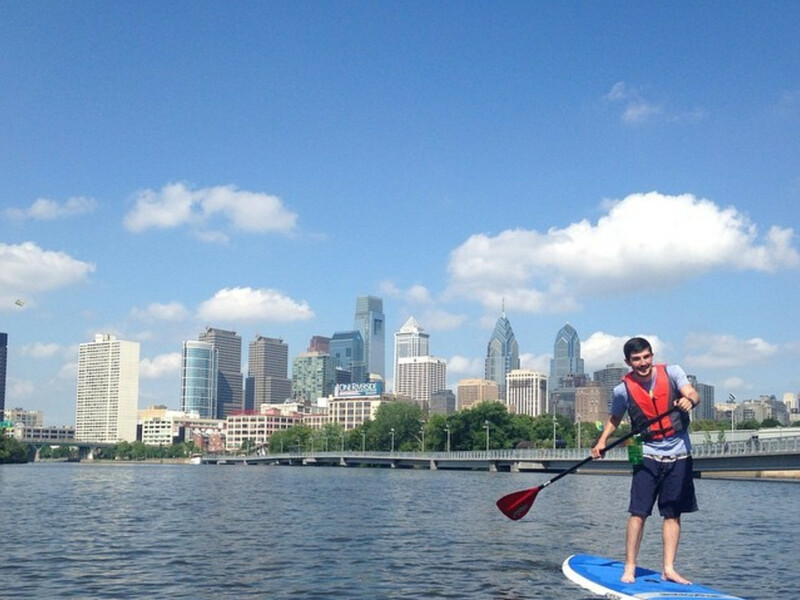 But until then, I'll be glad to visit Standup Philly again for a SUP tour or rental.